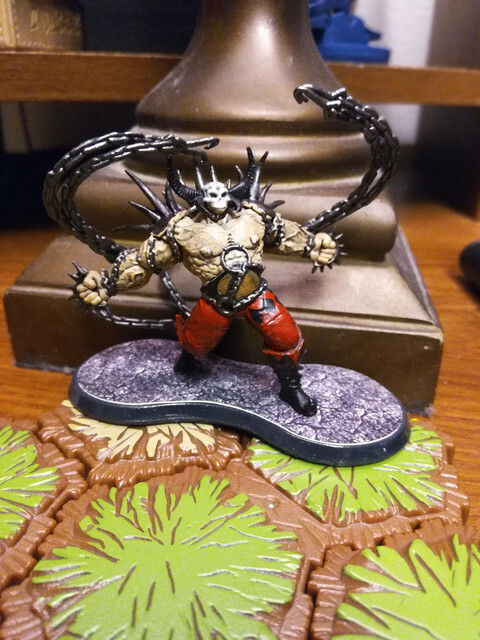 AotP Blender A place to discuss AotP customs and ways to integrate Heroscape with AotP. 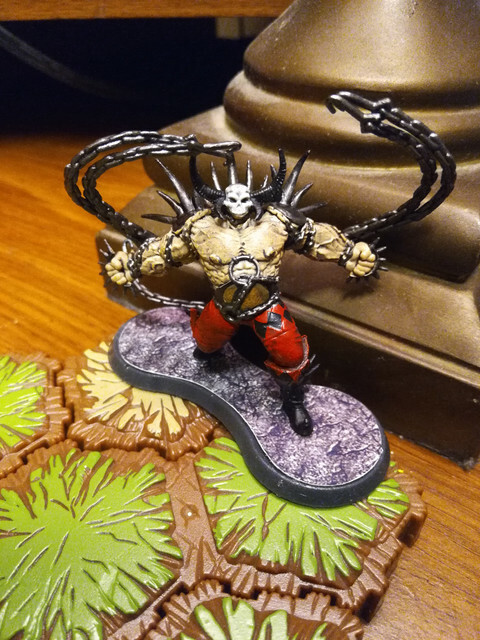 So I wanted to try and kickstart a new line of AotP customs, as well as share some of the recent things I've been working on with regard to Arena of the Planeswalkers. I specifically intend this thread to be focused around the recent line of Wizkid's Magic: The Gathering themed D&D miniatures. 1). 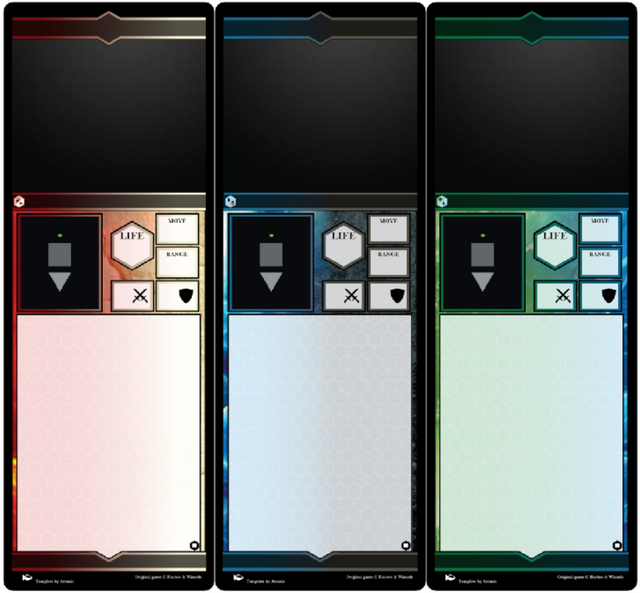 Present my ideas on some new Card Types/Rules Variants. 3). Create a Public Design space where people can share their related creations and give feedback to each other. I'll start by talking about the first one. But first, let me give you a brief rundown on what exactly this whole Guild stuff is all about. For those who don't know, the City of Ravnica is a planet-wide city and one of the most popular Planes in Magic: The Gathering. There have been several sets based on Ravnica, including a couple of the most recent ones. Ok, so what does this all have to do with Arena of the Planeswalkers? Well, it turns out that one of the newer D&D line of miniatures has all of their figures based on these Guilds. So if we want to stay true to the MTG theme, it helps to be familiar with the source material. 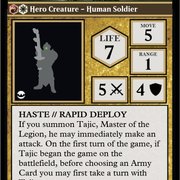 In addition, it helps me set up the pitch for my super cool custom design idea for Guilds of Ravnica customs in AotP: Hybrid cards! Hybrid cards have been around in Magic for quite some time. As it turns out, the first Hybrid cards were actually released along with the original "Ravnica: City of Guilds" expansion back in 2005. Hybrid cards are considered to be both of their respective colors, but can be summoned using just one of their listed mana types. 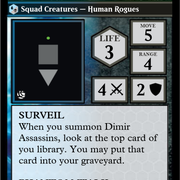 For example, a hybrid card that belongs to the Selesnya Guild (W/G) can be summoned using either White or Green mana. I'm not suggesting that ALL of the new units be made into hybrid cards, but it is definitely something I think should be worth considering for certain units. After all, the more choices one has while Army building, the better! Hybrid cards certainly help with that. Other cards, especially Unique Heroes and other iconic figures, should be multicolored in the 'traditional' gold-bordered way. That's because they specifically must embody both colors, not just one or the other. Speaking of which, that brings me to my second addition / suggestion for custom Arena content: Generals! The lack of multicolored Planeswalkers in AotP, combined with the plethora of multicolored Squads and Heroes in the Ravnica set caused me to think of a new Gameplay type / format. 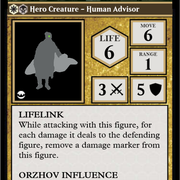 Rather than choosing a Planeswalker, Players could choose any UNIQUE Hero Creature to be their General before the game. All creatures in that player's army must match one or more of the colors on the General's Army card, and cannot include other colors. (For those who play MTG, this is very similar to the Commander format rules). Unique Heroes are usually named characters with powerful abilities or stats. They cannot summon and do not have a Spellbook. Instead, your armies deploy in a starting zone, akin to standard Heroscape armies. It is potentially possible to mix games between Planeswalkers and Generals. I have not tested this type of gameplay (yet) but I hope to do so in the near future. Stay posted as I update this thread with more information. Last edited by Skyver; April 11th, 2019 at 01:35 PM. 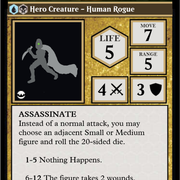 For people interested in making customs, I have compiled a mostly-complete list of all the figures in the set, with information added such as what MTG card each miniature is based on, as well as the suggested colors and creature types (Squad or Hero) for AotP. This list should be especially helpful for Non-magic players in order to help them track down artwork, colors and other information about the figures they are interested in. The suggested types (Hero, Squad x2 or Squad x3) are based on figure availability, according to the indicated rarity. I put quite a bit of effort into it, so I hope someone out there finds it useful! COLOR/S = (INSERT) ... Add 'Hybrid' if desired. I'll include text versions of a few of my own designs here soon, too. I can't wait to see what things you guys come up with! If you would like me to make a card for your design, let me know. I also plan on posting a guide/templates for that, too. Let's breathe some new life into this game! Last edited by Skyver; April 10th, 2019 at 02:43 PM. I have quite few ideas but I decided I want to narrow down to just one or two guilds and nail those down before going on to the rest. 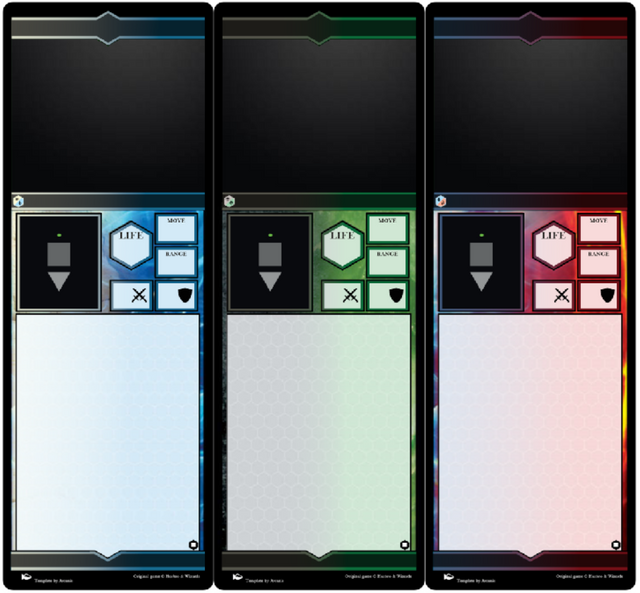 I'm probably going to be focusing on the two following guilds to start with: Selesnya (Green/White) and Izzet (Blue/Red). The two guilds are diametrically opposed, as one favors order and safety while the other prizes innovation and reckless pursuit of advancement. They are also combinations we haven't seen yet in AotP. 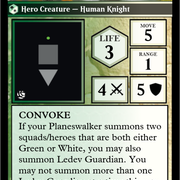 If your Planeswalker summons two squads/heroes that are both either Green or White, you may also summon Ledev Guardian. You may not summon more than one Ledev Guardian at a time this way. While attacking, if Ledev Guardian would assign enough damage to destroy a defending figure, you may have it assign the rest of its damage to a figure adjacent to the defending figure. 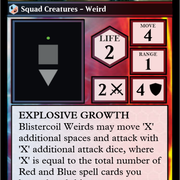 Blistercoil Weirds may move 'X' additional spaces and attack with 'X' additional attack dice, where 'X' is the total number of Red and Blue spell cards you have played this turn. Let me know your thoughts. Also, what do you think of the Hybrid cards in general? Or "General" Variant? My hope is for this to be a collaborative project. All ideas are welcome! Last edited by Skyver; April 11th, 2019 at 01:37 PM. One of my Journeyscape players makes custom AOTP spell cards, I can ask if he would be interested in writing some up if you want. Otherwise, I'm liking what I'm seeing. Also, Ledev Guardian... From the looks of it, I don't think it'll even fit on a double peanut base. How will movement work on that? As far as Ledev Guardian, I don't expect it to be too much of a challenge. It's not as big as it looks. 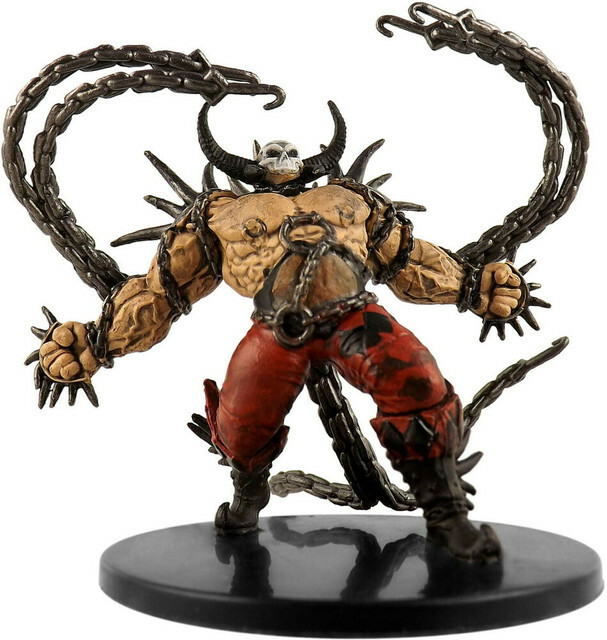 I ordered some of the figures, including that one so I'll be able to try it out for myself. Oh, sweet! Let me know how it goes. Yeah, I plan on posting some pictures here once I get them in. As far as Ledev Guardian. Looks perfect! Thanks for sharing. I'll post up some pictures of my own figures soon. Awsome! That original photo made it seem much larger. And here he is on different bases. Small Peanut, Large Peanut, and 'Large' single-hex. 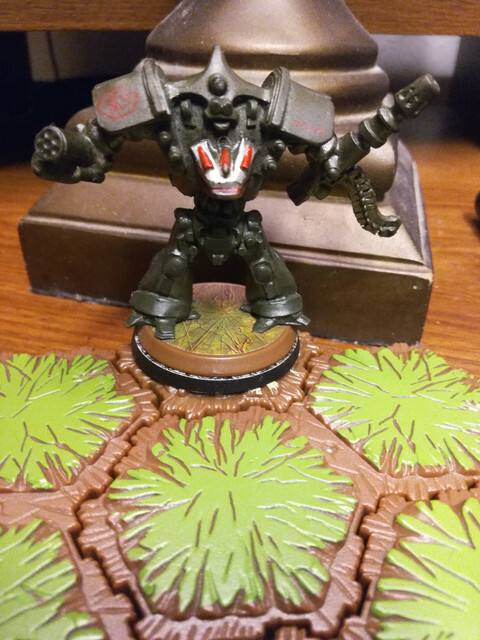 By the way, I love this miniature! It looks even better in person. I'll probably end up going with the Single-Hex base. 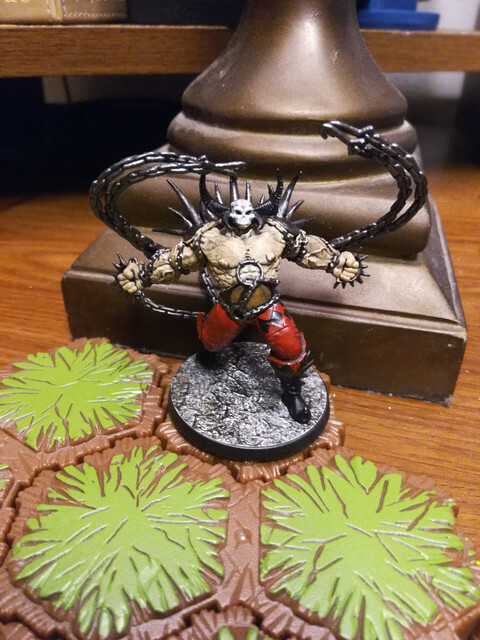 The single hex base is from Impact miniatures and is similar in size to the one used by Deathwalker 9000. 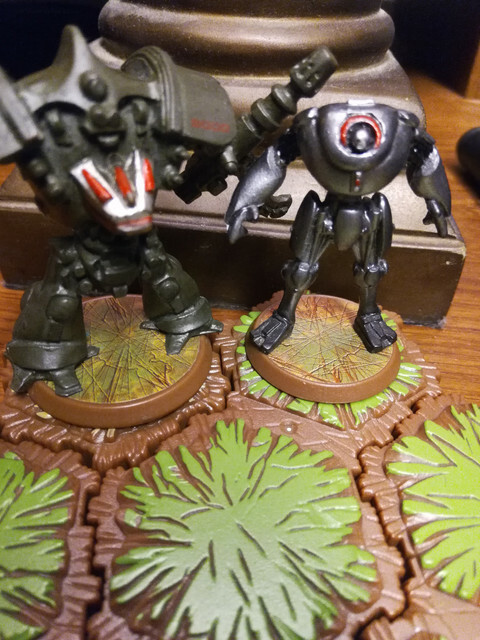 Here is a comparison of Deathwalker 9000's base compared to the Impact one and a Standard HeroScape base. Last edited by Skyver; April 12th, 2019 at 08:58 PM.